Joan McAlpine MSP praised crafters from Dumfries and Galloway whose work was selected for the prestigious 2018 National Exhibition of the Association of Guilds of Weavers, Spinners & Dyers on Friday. 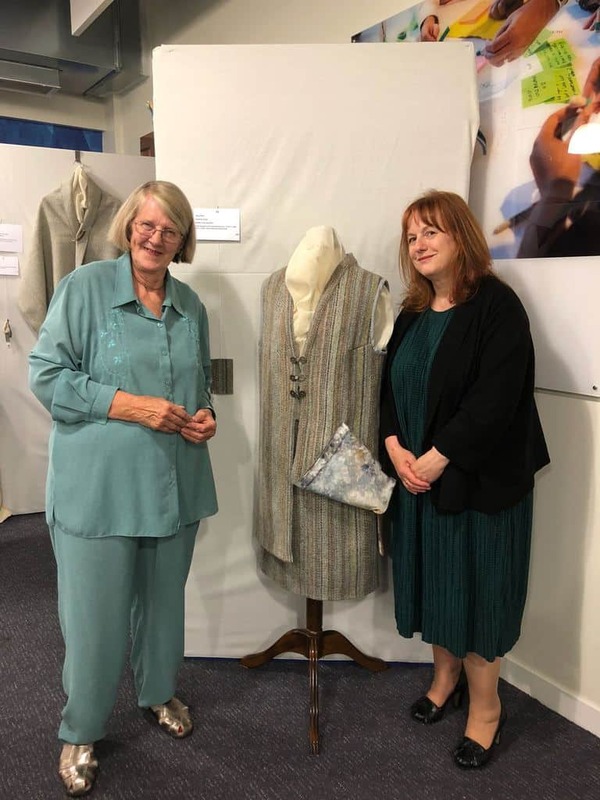 The UK wide exhibition opened at Strathclyde University and Ms McAlpine attended along with Margaret Vaughan, President of the Dumfries and Galloway Guild, who was also an organiser. Original pieces from Dumfries and Galloway selected for the show included Fiona Moir’s hand dyed and woven tunic (pictured) and a number of tapestry items by Rita Corbett, including the Saltire that became the symbol of the exhibition. (pictured). The selected items in the competitive section included a beret in suffragette colours, finely spun hand dyed silk scarves and intricate tapestries featuring people, birds, animals and architectural themes. Hundreds of examples of textile jewellery in the style of Charles Rennie Mackintosh were displayed in the open competition. Also making a surprise appearance – though not in person – was the Castlemilk Moorit, a rare breed of sheep created by Sir Jock Buchanan Jardine on his Annandale estate more than a century ago. Wool from the Moorit featured as knitted bunting from breeds across the UK. “It was a pleasure to accompany Margaret to the exhibition this evening – she has done a lot for the arts and crafts community in Dumfries and Galloway as President of the branch of Weavers, Spinners and Dyers Guild – as well as running one of the regions’ most successful small businesses ‘By Heck! Preserves’. “The talent on show tonight was extremely impressive. Weaving, spinning and dyeing are an important part of our cultural heritage in Scotland and in Dumfries and Galloway – where many towns have a history of producing yarn and fabric. Langholm is of course known globally for its textiles, and the Sanquhar pattern is an instantly recognizable piece of our heritage. The whole of the South of Scotland was well represented, with the Suffragette hat being made by a member of Tweed Guild. “There is renewed interest in “making” and traditional skills among the young. Such crafts take patience and skill but are extremely sustainable. The guild offers workshops and support and a chance to help each other and make friends.